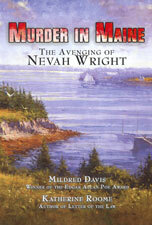 On a warm summer evening, on an island off the coast of Maine, five teenagers jump off a dock to go scuba diving. - And Sport Abbott, whose parents dream of a marriage between their daughter and Talbot. In the guilt ridden years that follow, each one of the survivors pays for the thoughtless moment. Nine years later, returning to her beloved Ledge Island to spend a year writing her doctoral thesis, Sport must learn to live as a neighbor with the parents of "Nevah" Wright, the teenager who came up dead that night. Sport also meets the new island doctor, Steve Schwartz, who carries a load of his own guilt. As months go by amid the islanders' whispers and gossip, Sport senses that she is being stalked. When the families of four survivors gather on the island to celebrate Christmas, it's Sport's time to pay. Our orders are processed by Paypal for increased security. "The authors smoothly integrate light social criticism into the engaging storyline. Well written, evocative mystery." 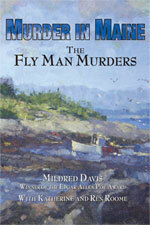 "I am not a mystery reader, but 'Murder in Maine' was a book I couldn't put down"
"This page-turner, set on an island off the coast of Maine, kept me wondering right up to the last few pages. It is fast-paced and readable. Mystery buffs should really enjoy it." Mildred Davis is the author of fourteen mystery novels, including They Buried a Man (Simon & Schuster), The Voice on the Telephone (Random House), and The Room Upstairs (Simon & Schuster) which won the Mystery Writers of America Edgar Allan Poe Award. Her daughter, Katherine Roome, is the author of Letter of the Law (Random House), and co-author with her mother of Lucifer Land (Random House), an historical novel set in Westchester County during the Revolutionary War. 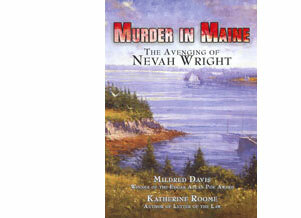 Midred Davis lives in Westchester County, New York and Katherine Roome lives in Washingston County, New York. Roger G. Innes, grew up in New Jersey and attended Villanova University. He received his law degree from Ohio Northern University and practiced as a litigation lawyer in Philadelphia, South Jersey and Maine. He has been a Bar Harbor resident for over thirty years. E-mail us for more information about wholesale direct-to-store sales. We’re also available for author signings. We even bring free coffee! "We defy you to put this one down before you've discovered why Kitten Corwith never left her upstairs room. If there had never been a 'novel of suspense' before, the phrase would have had to be coined to describe this story." "Novels that display so high a quality of prose and sensibility are rare these days."